Students and aircraft aficionados recently gathered for a distinguished lecture featuring Paul Bevilaqua, the former chief engineer in Lockheed Martin’s Skunk Works. 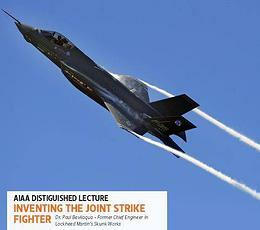 Hosted by the OSU chapter of the American Institute of Aeronautics and Astronautics (AIAA), the lectured featured Bevilaqua’s in-depth discussion of the F-35 Joint Strike Fighter, developed to meet the multirole fighter requirements of the U.S. Air Force, Navy, Marine Corps, and allies. Bevilaqua spoke about the challenges involved in developing aircraft and how it has become an international program, with many engineers developing a single replacement aircraft for multiple aircraft types.